The cinema is one of our nation's favourite pastimes, and we are lucky to have a fantastic Cineworld here in Bolton. Thousands use it every week, myself included, and here is my thought's on one of the latest releases . . . Django Unchained. 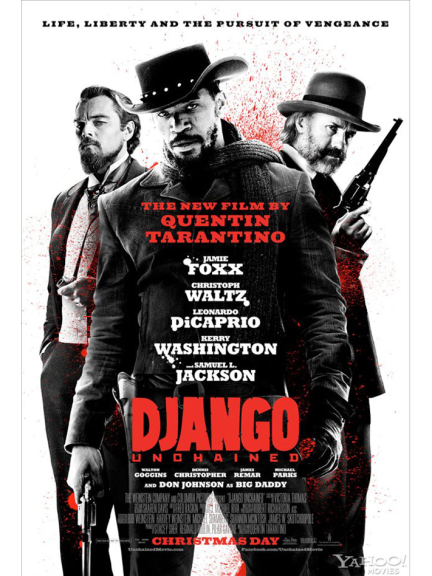 Set two years before the American Civil War during a time when the slave trade was booming, the film follows the plight of Django, a black man bound in slavery. When he is separated from his wife and sold at a market, fate presents him with a chance for freedom thanks to the enigmatic and eccentric Dr. King Schultz, a German immigrant dentist and bounty hunter. Having helped Schultz track down the ruthless Brittle brothers, Django joins him in a journey across the southern states of America collecting bounties, whilst also searching from Broomhilda, Django's German-speaking wife. Locating her and prising her from the grip of her current owner, Calvin Candie, are two completely different tasks altogether. And so it proves to be that rescuing her from the cluthes of Candyland will result in death, destruction, and downfall. The film is typical Tarantino magic, an uncompromising blend of bold, beautiful, and blood. It's cinematic in a different way, in a unique way, in a Tarantino way; if you've seen any of his other films (and you should have done), you'll knwo what I mean. But, underneath the exaggerated bullet wounds and Mandingo fighting, there is a touching story; of a man trying to reunite with his wife in an era where society told him he had no right to do so, of the hardhip and desperation faced by these people and the servitude instilled into them, and of the blossoming friendship between Schultz and Django, two people who could not be more different. Historically, the film is fairly accurate, with the usual amount of creative license required to fulfil it's entertainment purpose. There will be cries of outrage for some of the language and the almost comical-nature of the violence, but it is a Tarantino film through and through, and a must-see for this year. The screen I was in was busy without being too crowded, and the reactions of the masses mirrored my own; of laughter at the witicisms of Dr. Schultz, of affection for the blossoming relationship between the bounty hunter and the slave, of sadness at the plight of these slaves, and yes, of the standard squemishness which Tarantino evokes with every gun shot. It wouldn't be a Tarantino film without it. And this most definitely is a Tarantino film.